For the Inuit, everything has an Anirniq—a soul. A lump of ice scrapes against the oxidized copper fixed to the bow of our schooner, Opal. The sea is dead quiet. As we sail deeper into the mouth of Scoresby Sund, the amount of ice chunks that break-up the black colour of the water grows. 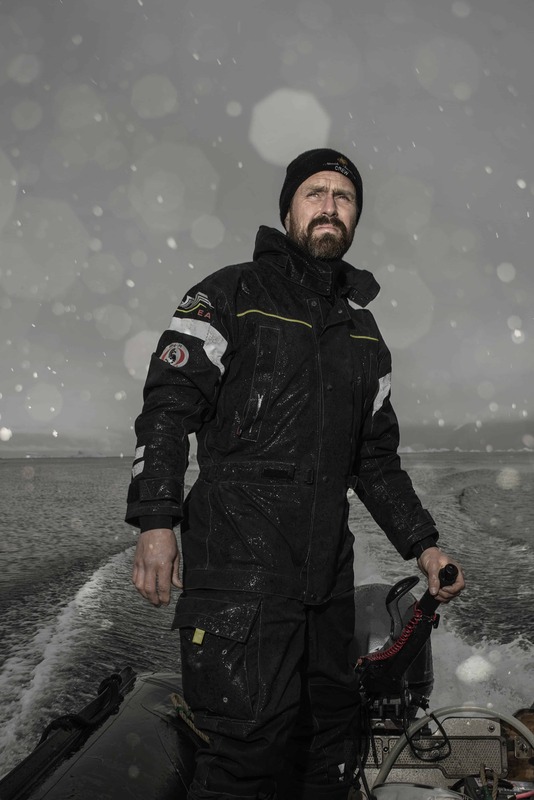 Captain Heimir Harðarson gives us the command to pull in the already reefed sails and pursues his course via noiseless electric propulsion. The ice propagates quickly; like curious white sea creatures coming to inquire from all around. Chunks become blocks and plates; then a majestic blue iceberg looms at the horizon. The ice is everywhere now. Slush scrapes slowly against the copper and disappears under the bow. Carefully we approach Solglacier, a 12-kilometre-long ice mass moving at a rate of 10 metres per day, which is considered a fast-moving glacier. The unstoppable mass creates a continuous, deafening spectacle. Shreds of mist drape against the black basalt walls lining the fjord, which look down upon us like 2,000-metre-high gatekeepers. A blue icy avalanche breaks loose with a sound like a jet fighter smashing the sound barrier. Blue ice is old ice. On the right, a thousand lumps fall towards the water—freed from the glacier to which they have belonged for thousands or maybe even tens of thousands of years. Opal quietly maneuvers along, deeper and deeper into Scoresby Sund. Scoresby Sund—Kangertittivaq in Inuit—lies in the northern Arctic Ocean on the eastern coast of Greenland. The coordinates are 70° 32’ north and 24° 21’ west, which positions us well above the polar circle. The area was named after the English whaler and explorer, William Scoresby. He mapped out these fjords in 1822. Scoresby Sund stretches 350 kilometres into Greenland, and is therefore the largest fjord in the world. Considering there are side-branches everywhere, it also represents the largest fjord system on the planet. The water can be as deep as 1,500 metres and the steep granite and basalt walls, which delineate the fjord, are sometimes as high as 3,000 metres. This is enough overwhelming nature to make you feel the smallest you have ever felt. 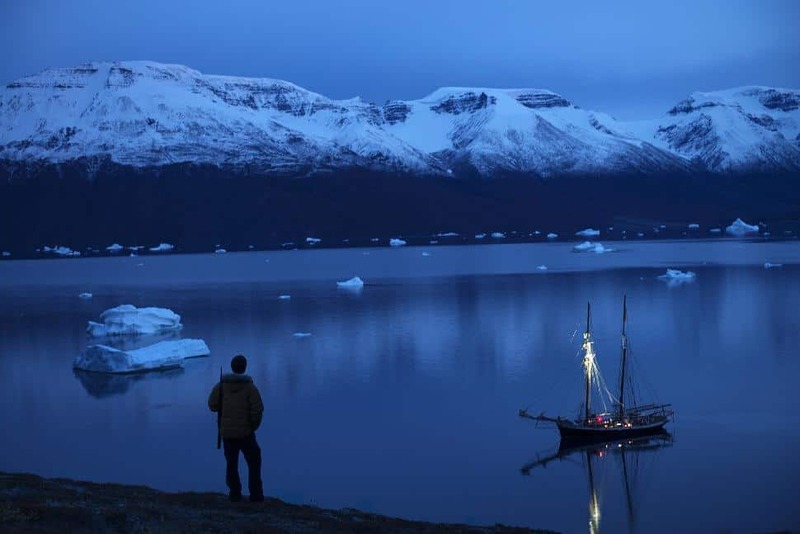 We sail from Constable Pynt, through Hurry Fjord in direction of Ittoqqortoormiit—the biggest city in East Greenland, with about 429 inhabitants. To better illustrate how isolated this area is; from October to June the sea is frozen, making it impossible to travel here by ship. The closest village on Greenland, with just 90 inhabitants, is situated 800 kilometres south. In between, there is nothing. The closest inhabited area is Húsavík in Iceland, some 500 kilometres away, and the home base of the Opal. Ittoqqortoormiit means “place with big houses.” Those houses are placed there like brightly coloured Lego-blocks with pointy roofs, contrasting against the dreary rocks. The dogs’ barking is deafening. There are three times as many dogs as humans living in this place. (Someone needs to pull the sleighs.) I climb onto the rubber boat and we cross over to the jetty. Several carcasses of seals are attached to the ladder and are swaying in the water. The sea acts as a fridge, and the dogs of Ittoqqortoormiit love seal-blubber. The family of Ingrid Anike welcomes us. They are serving stewed muskox; a nice fatty meat that resembles beef. Hunting is important here. The mouth of Scoresby Sund presents an area of open water in the winter, free of ice due to currents and winds, and is therefore the place for life. Birds, seals, Arctic hares and foxes, muskox and the mighty polar bear reside here. An Inuit killed by a polar bear? This is the revenge of Nanoek, the master of the polar bears. The boy who drowned in the sea a few hours before we arrived? Swallowed by Sedna, the mistress of the sea. And there is Mahaha, a demon who terrorizes the entire Arctic area and tickles its victims to death. People who freeze to death are often found with a smile on their face—and that’s said to be why. We sail into Fønfjord. It’s the first time in three days that we are blessed with wind. Captain Heimir gives the order to set out all the sails. 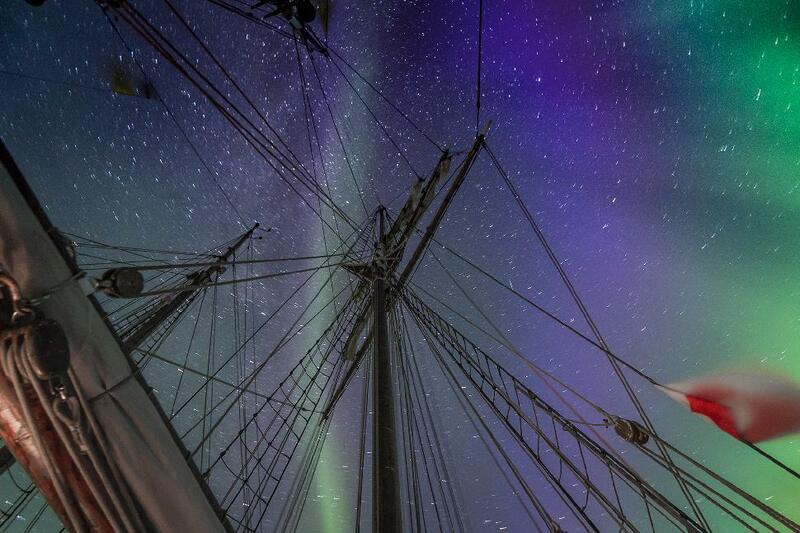 We hang onto the ropes until our hands burn and the sails are tight. In general, the fjords of Scoresby Sund are relatively calm, but it can be deadly when the Piteraq blows. The Piteraq is a katabatic wind, which originates from the Greenland ice cap and streams through these fjords. The ice cap is truly immense. Nine percent of all the fresh water on the globe is frozen in this ice cap, which is more than three kilometres thick in some places. And there is always a high-pressure area above it. When this runs into a low-pressure area at the coast, extremely fast winds may form—at times, hurricane force. A cloudless blue sky and black basalt tower above us, which slowly transforms into rolling hills covered in moss and other small plants. A muskox is grazing by itself while its soft hair flaps in the polar wind. My lungs fill with sea air. The schooner’s rigging is tight. The world around me is as it has been since the beginning of time; shaped only by natural forces and polished by the ice and wind. Such isolation begs questions: What to do if you were stranded here, on a beach of black sand? Where would you walk to? How would you survive? Nature runs the show here and she is not generous in these parts. Our day’s sailing finishes as we sail into Rødefjord. The Opal was built in Germany in 1951. From 1970 to 1983 it underwent a transformation to the elegant two-mast ship she is today, with her slender lines of oak and copper cladding. She was lovingly incorporated into the North Sailing Fleet in 2013, with whom I sail on this journey. The result is that even when we have no wind in the sails, the silence remains constant, which is a bonus in these parts. We only hear the rippling water and at times a small chunk of ice against the bow. Opal is also used for whale-watching in Iceland. Thanks to the silent movement, animals come closer to Opal than to any other ships. Night falls. A glass of Icelandic Brennivín (a type of schnapps) cooled by century-old ice—which we have chipped off an ice-lump for this purpose—enhances the mood. I’m staring at the star-speckled sky when suddenly a small green explosion stands out in the dark night. The spooky green light moves quickly through the sky. On my left, another explosion occurs, then right, then left again. Pink and orange gusts of fog are moving high up in the sky, sometimes as bright as spotlights, sometimes fiery. The Northern Lights have arrived. I have seen them before, but never like these. I have not seen them so clear, so often and for so long. It is also the first time that I can actually hear them. I stay up late, in awe. Who knows when you will see something as beautiful again? This is a place of constant unsullied beauty. You are almost afraid to turn your head to the right in fear of missing something on your left. As a travel writer and an avid sailor, I’ve been to many beautiful places. 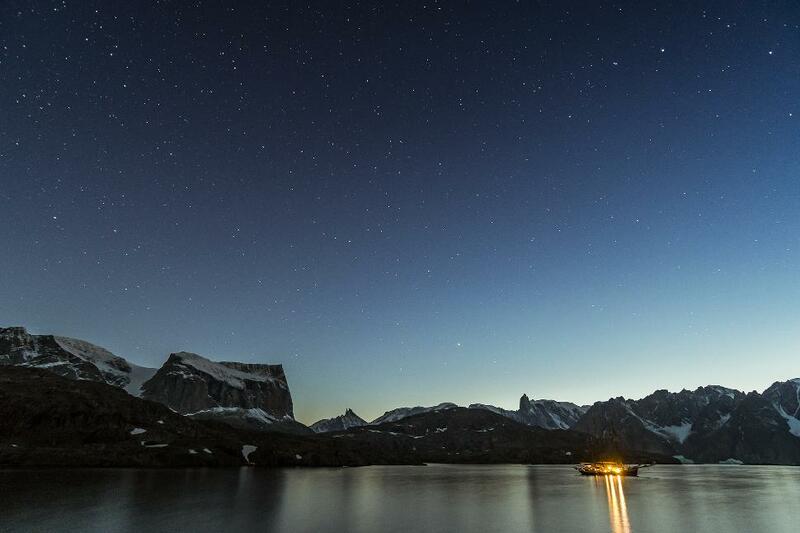 However, the waters of East Greenland are the most pristine and the most beautiful I’ve ever sailed. 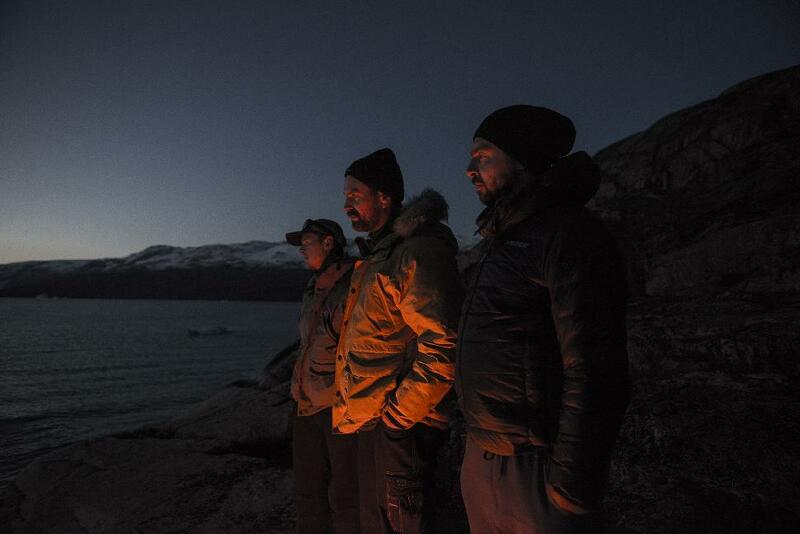 When we set sail back onto Ittoqqortoormiit we encounter the Bjørne Øer, the bear Islands. It is 4:45 a.m. and the sharp mountaintops of Bjørne Øer are kissed by the pink sunbeams. The sea is flat. Far away, at the horizon, an iceberg the size of a small city breaks off. The remaining ice behemoth has lost its balance and is slowly tumbling around, creating rolling waves. Thin ice has formed on the water during the night. This is a reminder of why we must leave Scoresby Sund. The East Greenlandic wilderness is closing up for the season; preparing for the return of unforgiving winter. Contact North Sailing (northsailing.com) and WOW air (wowair.nl).